The Livingston Depot is a beautifully restored 1902 Northern Pacific Railway station that operates as a museum typically from late May to early September. During the off-season, the Depot hosts wedding receptions, holiday parties, private dinners, historical talks, and more. For available date information and further details, call the Depot at (406) 222-2300 or visit www.livingstondepot.org. 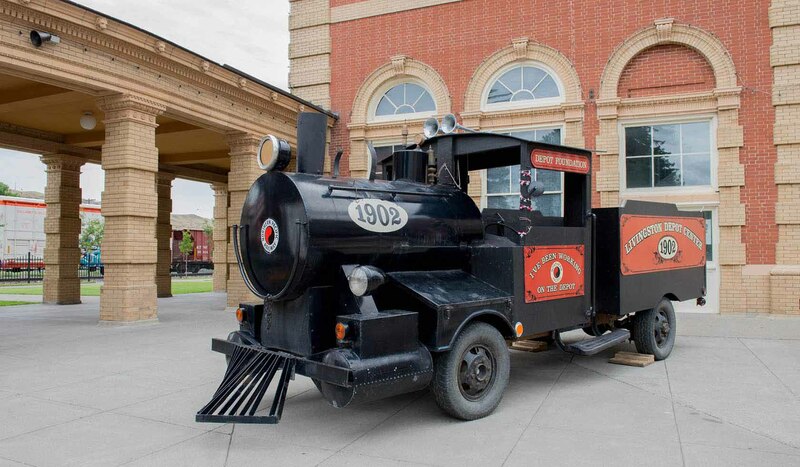 Our summer highlights include these: The museum exhibit 'Rails Across the Rockies: A History of People and Places' examines the Northern Pacific's key role beginning in the 1880s in introducing America to Yellowstone, America's first national park, as well as broader regional railroad history. The exhibit is complemented by 'The Livingston Depot in History and Architecture' as well as at least one new special exhibit each year. Depot Festival of the Arts. The Depot's three-decades-running art festival brings together over a hundred skilled fine artists and crafters in a wide variety of media with thousands of appreciative visitors. The event takes place July 2, 3, and 4 each year in a pretty trackside park with food and an always popular pie booth. Our off-season events also include a Railroad Swap meet in late April, a Cards Night in February, a Wine and Beer tasting in November, holiday events, and many more - see the calendar on our website or call us for details.